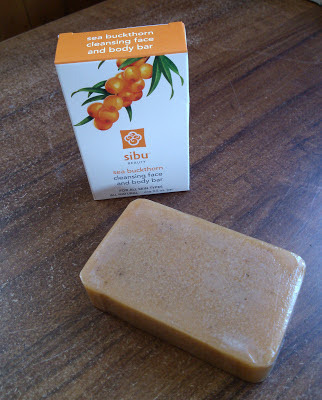 Sibu Beauty is a line of premium skin care products made from the Himalayan sea buckthorn berry. This "beauty berry", as it's known in parts of the world, contains over 190 bioactive compounds that restore and protect the skin, as well as nourish skin, hair, and nails with powerful antioxidants and essential fatty acids, including Omega 7 – a key building block to healthy skin. I was sent the Sea Buckthorn Cleansing Face and Body Bar for review, which contains 100% natural ingredients to cleanse and condition skin, promote tissue recovery and healing, and inhibit bacterial growth. The cleansing bar smells light and fruity - just enough to smell good but not overpowering. I was pleasantly surprised by the nice rich lather of the bar and how gentle it is on my skin. Sometimes bar soap is just too harsh for me, but this Sea Buckthorn Bar is really moisturizing and leaves my skin feeling clean and soft. One of my favorite features of this cleansing bar is that it also helps detox and repair skin, as well as creating a protective barrier against UV rays and free radicals. After I got a sunburn on vacation, I used this product a lot and I felt like it helped heal my skin quicker than normal. Another thing I like about the bar is that it hasn't gotten filmy or mushy at all, it still looks like new even though I've used it a lot. It is the best cleansing bar I have tried! Sibu Beauty also offers moisturizers, serums, and other topical treatments as well as dietary supplements that beautify and protect from the inside-out. Check out all of their products at SibuBeauty.com and be sure to follow them on social media as well.